Nellie has shared how she uses Blue Magic Upholstery Cleaner in both her car and her home. I used this product to clean both my couch and the seats in my car. My car seats are a light tan cotton, and with two infant daughters who grew into toddlers the stains became more noticeable. These stains ranged from formula to juice and ground in cookie crumbs. I sprayed the back seats with the Blue Magic upholstery cleaner and let it sit for about 30 minutes before using the brush head attached to the bottle to scrub the seats. It did not affect the color of the seats but the smell is very strong. I recommend using it in well ventilated areas. I wound up needing a stiffer brush than the attached one to be able to clean the car seats, but they were heavily soiled. After about an hour of scrubbing and wiping though all the stains were gone and the seats looked new again. I was so happy with the result I decided to do my sectional sofa as well. This required an additional can, but was still much cheaper than if I had rented or bought a steam cleaner. The smell was stronger when I used it inside the house so I moved some of the cushions onto the front porch. The stains were pretty much the same, milk, juice, and cigarette smoke and ashes. There was even tomato sauce on two cushions and the Blue Magic even got that up, but it did take a while. I was satisfied with the product but because of the smell I would not use it on a weekly basis, just for deep cleanings. Thanks Nellie for sharing your review of Blue Magic Upholstery Cleaner. Like you said, this product is specifically made for cars, but it can also be used on other upholstered furniture. You can share your own upholstery cleaners review here, and your auto upholstery cleaner review here, if you have used a product that has worked (or not worked) well for you, sharing your opinions and experiences with it. 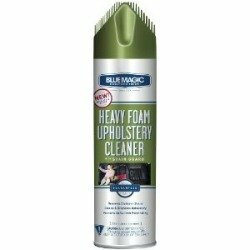 Kathryn has also shared her review of Blue Magic heavy foam upholstery cleaner. I have a recliner that I have used for almost 8 years. I have two cats and a dog, who often "share" the recliner with me while I watch TV. One day I took a good look at the chair and realized that it had become a mass of various stains--cat hairs and (my) food stains and, yes, I have to admit--some dog drool!! Yuk! I asked my friendly hardware man what might work. He said he always used BlueMagic on his upholstered furniture. I have known him for years and he is also an "animal" person so I tried it. I had to vacuum the chair first, which I didn't like, but wasn't a big deal. I "foamed" the entire chair and waited. Then I used the handy little brush on the end of the can to work the foam into 2-3 really dark stains. When it dried and I vacuumed it off, I really couldn't believe how great it looked. I'm sold on BlueMagic. The only two things I didn't like were having to vacuum the chair first and there was a little odor that was unpleasant, but I opened a window and that was gone in about half an hour. Thanks Kathryn for sharing your review of Blue Magic upholstery cleaner. Yes, you definitely needed to vacuum the upholstery first, before using the product, so I'm glad you did. The cat hair, of course, won't come off with upholstery cleaner, but more than that there is generally a lot of dust on upholstery that is not really visible to the naked eye. That dust, when wet, makes a kind of sludge which can make it harder to get the area clean so vacuuming is always a first important step in cleaning upholstery. I'm always looking for more tips. You can share your upholstery cleaning tips here, or read others that have already been submitted. Mildred has also shared her experiences with this product. I haven't used this product in my car, but I use it in the house on my recliners and couches. It is the only product I have found that removes old dirt, ground in dirt, new dirt, all stains and grease spots from food or oily stains from suntan lotion. It is absolutely amazing. I can't tell you how many products I've bought over the years and with no success or very little success with these kind of stains. Blue Magic is the only product I will buy from now on!!! I am looking forward to using it on the car upholstery. I strongly recommend this product for anyone doing any basic cleaning. Thanks Mildred for your review. Similarly, you can share your auto upholstery cleaner review here, or read other reviews which have already been submitted.